Civil Society Decries Continuous Land Evictions in the Uganda Published: April 23, 2012 A coalition of civil society organization has decried the continuous land evictions across the country that has subsequently caused violation of fundamental rights. Under the Food Rights Alliance, activists today embarked on a campaign that intends to the indiscriminate land evictions by individuals, private and public entities that have left many Ugandans landless. The National coordinator Food Rights Alliance Agnes Kirabo says that despite the recent amendment of the Land Act, families have been evicted from land by relatives, Investors and government in the name of development which has subjected the vulnerable children and women to untold suffering. Kirabo reiterated that the campaign that is geared towards initiating public debate on land rights was prompted by the adverse consequences of evicting families without giving them alternative land since land is the source of livelihood for all. The Vice Chairperson of the Food Rights Alliance Bridget Mugambe suggests that land should not be considered as an incentive for investors saying this will put many Ugandans at risk of being evicted from land under guise of investment. The National Land campaign that will be engaging academia, policy makers, and religious organizations aims at the land tenure governance in Uganda supports food security, Poverty reduction and environmental protection. It is the image of land which has been vacated by former occupants. The photo above clearly shows graves where bodies have bee exhumed and re-located. These developments are common today as land use changes. The Plant which is planted in some parts of Uganda to demarcate the boundaries of land. His Eminence Emmanuel Cardinal Wamala (in the centre) will be the Main Celebrant. Sunday, 6th May 2012 will see all the Sub - Parishes under Lweza Catholic Church come together for the day's Mass. It is the Parish Day and the Main Celebrant will be His Eminence Emmanuel Cardinal Wamala. There will be no mass in all the Sub - Parishes. The day is observed every year to brig together all the Sub - Parishes once a year in worship. Mass will start at 10.00am. Reverend Father John Mary Vianney Mugabo - the Parish Priest of Lweza Parish Church. The look of the office block which was recently completed and in use now. The building above is to have a Canteen - it was put up by Lweza Sub - Parish as an income generating project. Kiwamirembe Shrine is under Lweza Parish. The place is growing more popular ad it is visited by many for worship. Above is a sign post along the road to Kajjansi Fisheries which some take to avoid traffic jam. 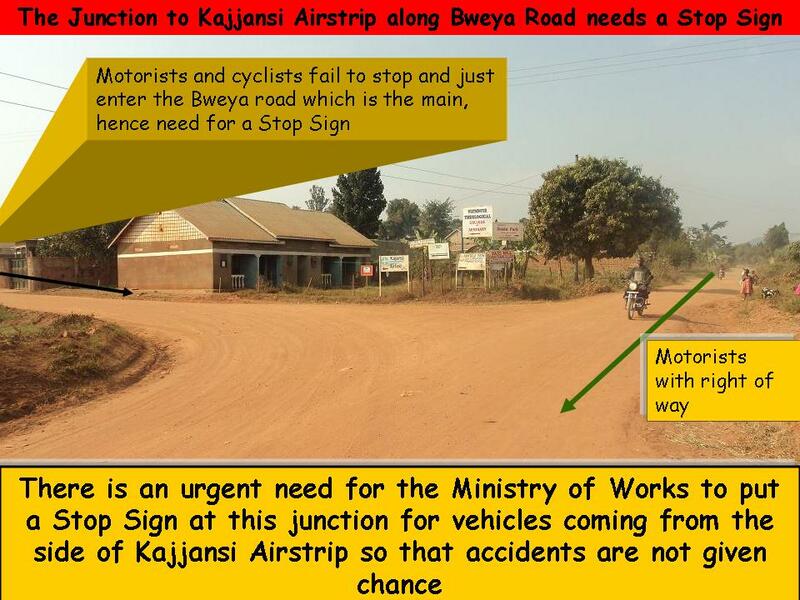 CAN THE MINISTRY OF WORKS OR UNRA PUT A STOP SIGN POST AT THE JUNCTION TO KAJJANSI AIRSTRIP? The proposed Kampala – Entebbe Expressway project is a 4 – lane road of 51.4 kilometres comprising (i) an Expressway between Kampala and Entebbe International Airport; and (ii) a spur to the Munyonyo Resort. Physical works on the project are expected to start in 2012. This project will provide an efficient mass transit route between the two most important cities in the Greater Kampala Metropolitan Area (GKMA) region (i.e. The Capital, Kampala and Entebbe International Airport) and will therefore form a crucial part of Government’s overall strategy for decongesting Kampala through construction of an inner beltway comprising the Kampala Northern and Southern Bypasses as well as an outer beltway along the edges of the GKMA. This project is therefore consistent with objectives of the Master Plan for the Greater Kampala Metropolitan Area (GKMA) prepared in 2004. 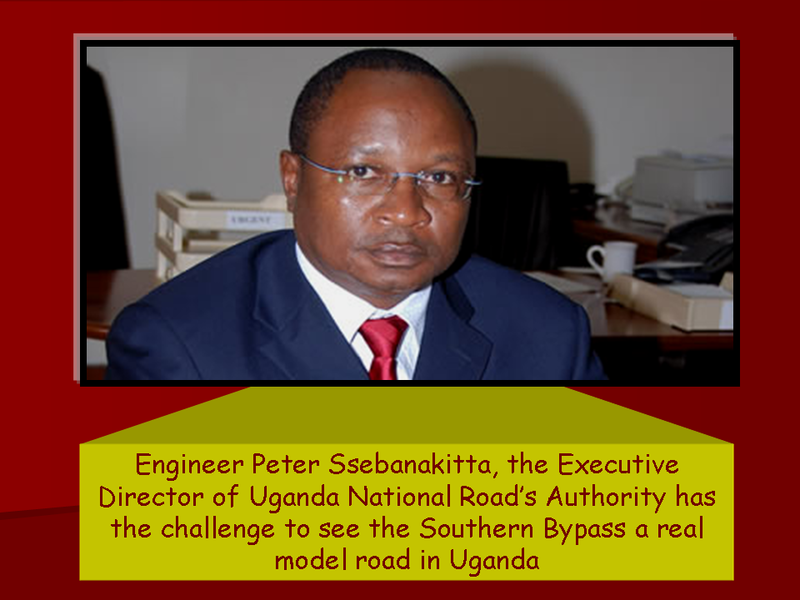 Mr. Peter Ssebanakitta Sir, the people to be affected by the road will be grateful if the Government pays them before they are told to relocate or before they give up part of their land. Uganda National Roads Authority (UNRA) has advertised dates on which the public to be affected by the Southern bypass or new Entebbe Highway are to be briefed and will have their questions answered. The 37 Km long Highway will have two lanes either side and construction is scheduled to start in July 2012, and shall take 4 years. The Government of Uganda borrowed funds for the project from the Government of China. The Highway shall start from Busega, where it will connect to the Northern bypass. The Highway will cross Masaka road at Kabojja, then to Kasanje, Kinaawa and Kazinga. It will continue to Nkungulutale, Ssisa then through the wetland of Nabingirwa before joining the existing Entebbe Highway at Mpala, and shall connect to Entebbe Airport using the existing route. The project has another road component of 13km from Kajjansi to Munyonyo passing via Lweza, Kitiko – Birongo, Mutungo Central, Kigo – Lunya, Ziranumbu, through the wetland of Kawagga then to Munyonyo. M/S Mott Macdonald Uganda Limited and Uganda National Roads Authority (UNRA) are jointly involved in the project. More information on the project can be got using the following telephone numbers: +256 776 564564, + 256 772 517492, +256 782 703382 TIMETABLE FOR THE CONSULTATIONS NSANGI SUB-COUNTY 1. On April 17, 2012 consultations were scheduled at Kabojja ‘B’ and Nkokonjeru ‘A’ villages, in Nsangi parish, the meeting took place at Kabojja ‘B’ Chairman’s residence, starting at 3pm. 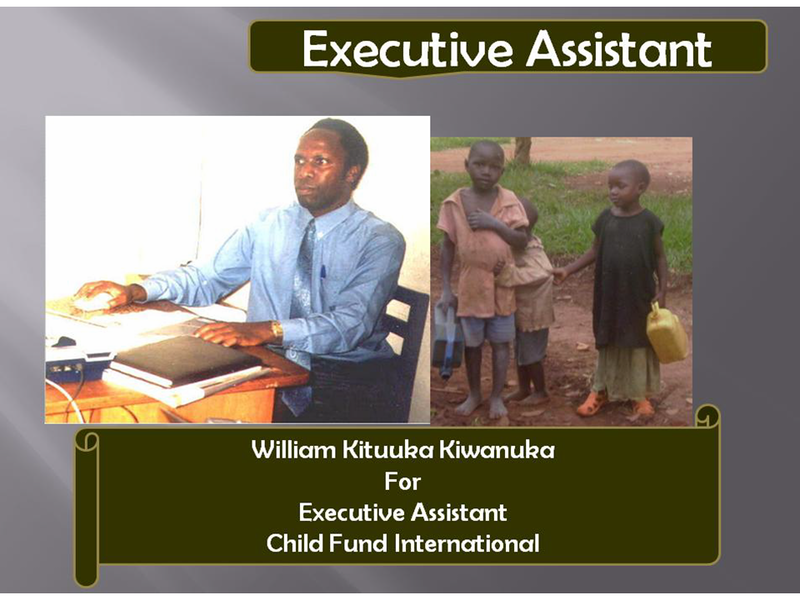 The contact person is Mr. Masagazi Luyima Tel. 0772 442226 2. On April 18, 2012 consultations were scheduled at Kabojja ‘A’ village, Nsangi parish, the meeting took place at kabojja Coffee Factory starting at 3pm. The contact person is Mr. Magara Frank 0712 726600 3. On April 18, 2012 consultations were scheduled at Kinaawa village, in Kasenge parish, the meeting took place at Good Hope Primary School starting at 9.00am. 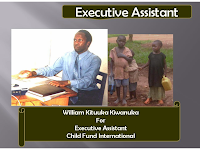 The contact person is Mr. F K Susa Ssalongo Tel. 0772 410370. 4. On April 20, 2012 consultations were scheduled at Bandwe and Nalumunye, Kasenge parish, the meeting took place at Bandwe Primary School starting at 3pm. 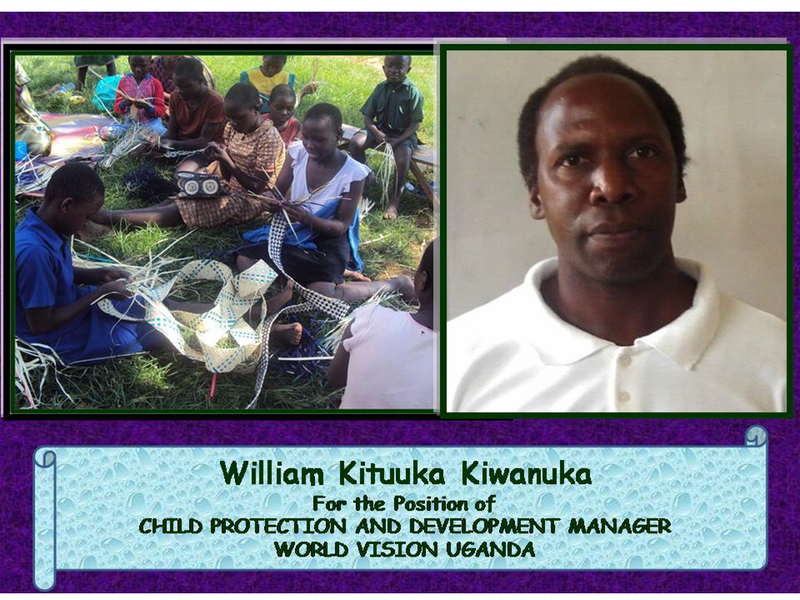 The contact person is Mr. Katabalwa John Tel.0774 050513 5. On April 23, 2012 consultations were scheduled at Katale Bukwenda, Kasenge parish, the meeting took place at Mr. Senfuma’s hall starting at 3pm. 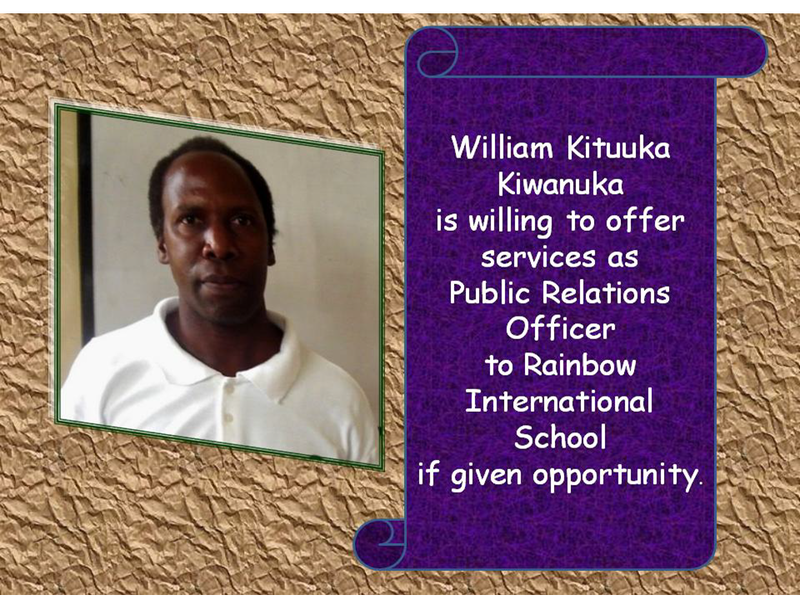 The contact person is Mr. Kakonge Charles Tel. 0782 932969 6. 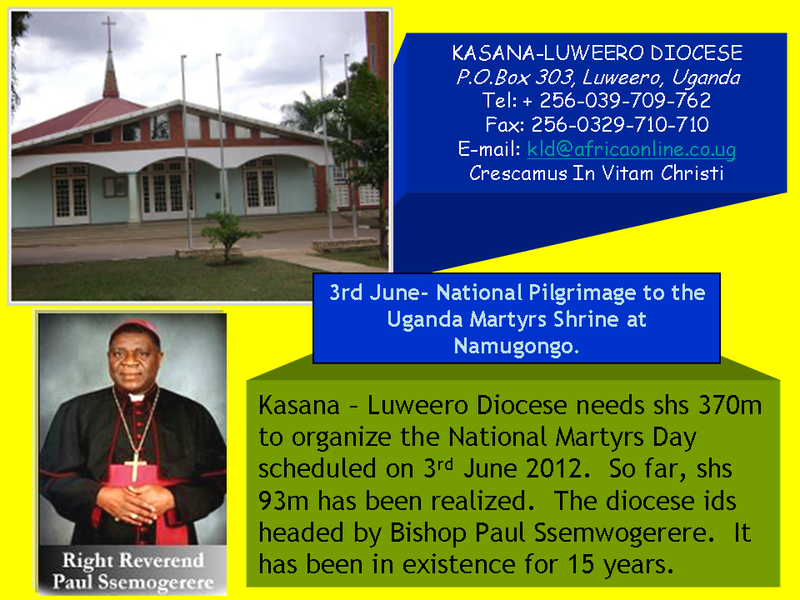 On April 24, 2012 consultations were scheduled at Katale Busawula, Kasenge parish, the meeting took place at Kitawuluzi starting at 3pm. 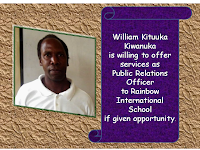 The contact person is Mr. Kaluma Christopher Tel. 0782 386092 SSISA SUB-COUNTY 1. On April 26, 2012 consultations were scheduled at Nakigalala ‘Kifene’ (Jack Fruit Tree) village, Kitende parish, the meeting took place at the Jack Fruit Tree starting at 3pm. The contact person is Nabukenya Dorothy Tel. 0772 430614 2. On April 27, 2012 consultations were scheduled at Makandwa village, Kitende parish, the meeting took place at the House of the LC1 Chairman starting at 3pm. 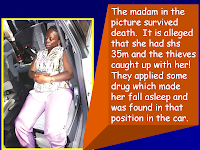 The contact person is Nabukenya Dorothy. 3. On April 30, 2012 consultations are scheduled at Lumuli village, Kitende parish, the meeting will take place starting at 3pm. Contact person is Nabukenya Dorothy 4. 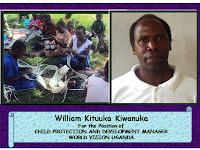 On May 1, 2012 consultations are scheduled to take place at Kirumba/Kiryamuli villages, Namulanda parish, the meeting will take place at Sekiwunga Church starting at 3 – 5pm. The contact person is Ssesanga Tel.0775 184392 5. On May 2, 2012 consultations are scheduled to take place at Wamala village, Wamala parish, the meeting will take place at Wamala trading centre starting at 10 – 11am. The contact person is Namand Tereza Kizito Tel. contact 0772 071278 and 0712 955354. 6. On May 2, 2012 consultations are scheduled to take place at Lutaba Village, Wamala Parish, the meeting will take place at Wamala trading centre starting at 10 – 11am. The contact persons are Namande Tereza and Kizito. 7. On May 2, 2012 consultations are scheduled to take place at Bukesa village, Wamala Parish, the meeting will tke place at Ziru Primary School starting at 3 – 5pm. Contact persons are Namande Tereza and Kizito. PARLIAMENT CLEARS NEW ENTEBBE ROAD HIGHWAY FINANCING Posted May 3, 2011 OUTGOING PARLIAMENT APPROVES FUNDING FOR NEW ENTEBBE HIGHWAY The parliamentary session in Kampala (of the soon to be retired outgoing house – when it makes way for the newly elected members) – made a landmark decision to approve the proposed funding for the Entebbe highway. Government is now able to conclude a loan agreement with China over 350 million US Dollars, which will help to design the new highway, acquire land where necessary and then build it, connecting the ‘Northern Bypass’ to a new routing around the present major emerging population centres at the ‘old route’. The two highways will join just outside the municipality but will have several access points, notably near Lweza / Kajjansi from where a lakeside road will then lead to the Munyonyo side of the city, and from near Abaita Ababire, home of Nkumba University and the last centre outside Entebbe itself. From where the ‘two’, the old and new highway meet, a dual carriage section will be added to allow swifter traffic to the international airport, but widening that section will require some major land and building acquisitions which are thought to be a challenge, in terms of both cost and the speed required to complete the project within the planned time frame. There was expressed unease though by several parliamentarians over certain terms of the loan agreement, which also included the use of a Chinese consulting firm and a Chinese construction company, preventing any competitive bidding for the project and thereby setting aside the Ugandan procurement laws altogether. The loan, with a grace period of five years, is repayable over a twenty year period and the income from the toll road will be used towards repayment and maintenance. Subject to land acquisition construction is set to start in 2012 and could be completed by 2015, staying with the grace period during which no payments to the Chinese state bank are due. SHS 800BN FOR NEW KAMPALA - ENTEBBE ROAD By JOYCE NAMUTEBI and CYPRIAN MUSOKE THE Government wants to borrow US$350m (over sh800b) from the Export-Import Bank of China to fund the proposed Kampala-Entebbe Expressway in a bid to decongest Kampala city. The request was tabled in Parliament earlier this week by state minister for investment, Aston Kajara, and will be scrutinised by the relevant committee, which will make a report to the House. The Kampala-Entebbe Expressway is part of the measures to decongest the Central Business District and enhance trade movement through, within and out of the greater Kampala Metropolitan Area, a brief in Parliament stated. The statement noted that urban congestion is increasing in Kampala at an estimated rate of 4.5% annually with increased motorisation, Kampala is facing heavy traffic jams, especially during the peak hours. The project involves construction of a new highway starting from Busega-Mityana junction and would end at Entebbe airport. The expressway will join the existing Kampala-Entebbe Road at Abayita Ababiri and will also include a 14.1km spur to Munyonyo. Responding to concerns of members, Works and transport minister, John Nasasira explained that the Kampala-Entebbe Road can no longer accommodate current traffic. He added that both the old and new roads would be used concurrently. He added there would be a toll for the new road. 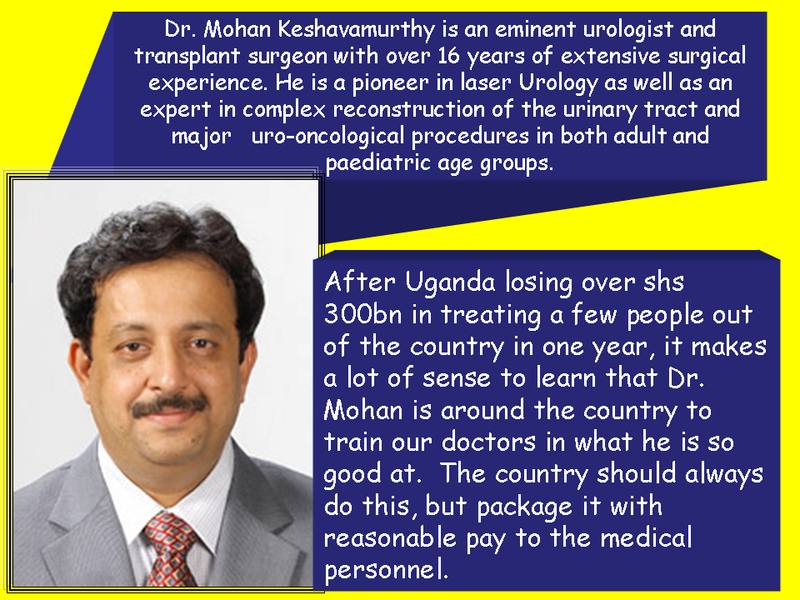 MS (General Surgery), M Ch (Urology), FRCS(C), FASTS Consultant Urologist and Transplant Surgeon Dr. Mohan Keshavamurthy is an eminent urologist and transplant surgeon with over 16 years of extensive surgical experience. He is a pioneer in laser Urology as well as an expert in complex reconstruction of the urinary tract and major uro-oncological procedures in both adult and paediatric age groups. He has performed over 250 Laser enabled Transurethral prostate Vaporization procedures (LASER TURP), 1500 laser fragmentation of kidney(RIRS) and ureteric stones(URS), 1600 kidney transplants, and 75 pancreas transplant. He is an acknowledged expert in implantation of flexible and inflatable penile prosthesis & penile lengthening procedures. Professional qualification A meritorious and award-winning student, Dr. Mohan, after completing his MS in general surgery finished his M Ch urology from the prestigious KEM Hospital, Mumbai. He then completed his fellowship in urogynaec-oncology from Tata Memorial Hospital, Mumbai. Besides these, he has done advanced training leading to a Fellowship in solid organ transplantation from QE II HSC, Halifax, Canada and Fellowship of American Society of Transplantation thereafter. Dr. Mohan has contributed more than 100 articles in various peer reviewed journals like Transplantation Proceedings, The Canadian Journal of Urology, British Journal of Urology International to name a few. Apart from being the Chief Investigator-Middle East for Neoral MOST study, he contributed significantly to the medical fraternity by presenting on various topics at different international conferences like Congress of the International Pediatric Transplant Association, American Transplant Congress, Transplant Odyssey, etc. Tags: Dr Mohna Keshavmurthy, laser TURP, nephrology, prostate enlargment, Urologist HEALTHCARE A MAJOR CHALLENGE FOR UGANDA Uganda has one of the worst healthcare records in the world, but the development of local facilities and training of volunteers will bring life-saving services to thousands of people in Katine Annie Kelly guardian.co.uk, Wednesday 1 April 2009 00.01 BST Article history Elias Oluja, lab technician from Tiriri health centre tests patients for HIV during his weekly visit to the lab at the Ojom health centre, Katine Elias Oluja, lab technician from Tiriri health centre during his weekly visit to Ojom lab in Katine. Photograph: Dan Chung Talk to locals in Katine, north-east Uganda, about what worries them most in life and the answer will probably be their health and the health of their family. Look at the statistics and it's easy to see why. Despite record investment over the past five years, Uganda's healthcare performance is still ranked as one of the worst in the world by the World Health Organisation. The country is ranked 186th out of 191 nations. A Ugandan's health and life expectancy is among the lowest across the globe. In Uganda, one in every 200 births ends the mother's life, around 1 million people are living with HIV and although malaria accounts for 14% of all deaths, less than 10% of children under five are sleeping under insecticide-treated nets. The African Medical and Research Foundation (Amref), which with Farm-Africa is working to improve lives of Katine villagers, funded by donations from Guardian readers and Barclays, says health has proved one of the most complex and challenging components of its work in the sub-county so far. During the 18 months since the Katine Community Partnership Project began, serious external challenges have emerged with increasingly poor and erratic drug distribution, lack of trained medical staff and equipment and the looming threat of a global recession disrupting progress. Now, at the halfway point of our three-year project, it is clear that hitting the ambitious health targets set in 2007 will not be easy. However, there have been some notable achievements. The new laboratory at the Ojom health centre was joyfully welcomed by the local community and now means that more than 15,000 people can easily access simple but potentially life-saving diagnostic tests for HIV, malaria and tuberculosis. In a country where 51% of people don't have any contact with public healthcare facilities, nursing staff at Ojom report that the lab has also increased the number of people accessing healthcare services at the clinic. "They come for a blood test and then they come and see us, whereas before they wouldn't have made the trip," says Richard Okello, a nurse working at Ojom. According to Amref, one of the biggest discoveries of the project so far is that helping to build functioning community structures can lead to a tangible improvement in healthcare and access to health services at a local level. So far more than 300 local people have been trained as volunteer community healthcare workers since the project began. There is now a network of village health teams (VHTs), traditional birth attendants (TBAs) and community vaccinators supporting healthcare programmes in Katine and acting as bridges between local communities and frontline health services. Across Katine, VHT members are going out to remote households and making referrals to public health facilities, and have distributed thousands of treated nets to mothers and children under five. TBAs trained by Amref to recognise danger signs in birth are now referring more mothers to clinics than ever before. Before the project began, overworked healthcare staff were unable to run outreach immunisation programmes. Now, thanks to the work of community vaccinators, 90% of children in Katine are immunised against killer diseases such as measles and polio. Local people are now starting to demand the right to decent health services. Negotiations over the building of a new clinic at Merok are underway with the district government after community leaders called for better access to healthcare services for thousands of people living in this remote part of the sub-county. At the same time the fragility and gaps in existing healthcare provision in the sub-county have been starkly exposed. One Amref staff member in Katine described trying to tackle poor healthcare services as "trying to put out a bushfire". As soon as you've put out one blaze, another one has started behind your back. A well-documented problem has been the chronic shortage of trained professional staff in Katine's healthcare facilities. This is a story played out across the country. Only 38% of healthcare posts are filled in Uganda. Those healthcare staff who are working, have little incentive to work in poor rural areas like Katine. Some 70% of Ugandan doctors and 40% of nurses and midwives are based in urban areas, serving only 12% of the Ugandan population. In Katine, the fact that there is still no doctor at Tiriri, the sub-country's largest healthcare facility, has been a serious blow to the central goal of improving healthcare services to those most in need. Amref says it has been lobbying the district government to get this post filled, but with no luck. The lack of drugs at Tiriri and Ojom is a glaring testament to the failure of the national drug distribution programme, something not factored in to health goals at the beginning of the project. Again, Amref says it is lobbying for this to be improved, but has no mandate to distribute drugs itself. One major concern is the effect this is having on the morale of the community healthcare workers so integral to Amref's health strategy for the project. Susan Wandera, Amref's deputy director in Uganda, says the lack of vaccines and empty drug stock rooms that greet locals who have been encouraged by VHTs to walk hours to a clinic, could haemorrhage support and undo many of the relationships nurtured throughout the first phase of the project. "External challenges, like lack of drugs and lack of healthcare staff, mean we are putting demands on our VHTs and community vaccinators, who are already doing a very difficult and demanding job on a voluntary basis," she says. "We cannot risk losing their support as they are absolutely essential to our work in Katine." Hovering above all this is the increasingly ferocious global financial meltdown, which could threaten to derail Uganda's national health budgets – half of which are now funded by the international community – and undermine all progress made in healthcare provision over the past decade. There is no doubt that the ripple effects of any cuts in development or aid budgets to Uganda's healthcare system will be felt in Katine. In the 18 months left to run on the Katine project, Amref says it is going to build on the work it has already started. Refresher training courses will be provided to VHT members, community vaccinators and TBAs, as well as professional healthcare staff. An additional 30,000 anti-malaria bed nets will be distributed across the sub-county. The next year and a half will also see an increased focus on family planning, with VHT members distributing contraceptive pills and running outreach education and awareness programmes around sexual health and family planning. On top of this the clinic at Tiriri will undergo renovations and be upgraded so operations will be able to be performed on-site, rather than patients being transferred to Soroti district hospital, if it can find the staff to carry them out. The immunisation programme will remain a particular focus for Amref as the project draws to a close. New refrigerators and chill-boxes are being supplied to Ojom clinic to help community immunisation workers extend their reach into some of Katine's most remote and vulnerable communities. It hopes to be able to transfer a fully functioning community immunisation framework over to the district government, and is aiming for 90% of children under five to be immunised against eight killer diseases by the time the project finishes its three-year cycle. 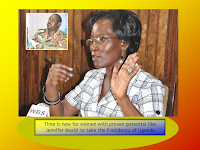 UGANDA NEEDS A JENNIFER MUSISI CALIBRE OF WOMAN FOR PRESIDENT Ugandans who are patriotic and believe in democracy agree that Museveni must retire by 2016 latest. If that is so, the country has the challenge in who can be supported for the highest office in the land. I love Uganda for among other things being a leader in many strategies a part from the Presidency where we have proven a bad example. Men have messed up the country for 46 years; since 1966. Time is ripe to flood a woman with votes, a woman who can turn around things, a woman who will not give patronage of the Museveni type chance, so that the few exploit the resources of the country. A woman who will not give chance the corrupt to go away with the loot, the so – called “Bagagga bato” (young millionaires) who are conduit of the looted national resources. Such a one with the abilities and braveness of Jennifer Musisi can see Uganda out of the mess. Time is now to look for that saviour woman. 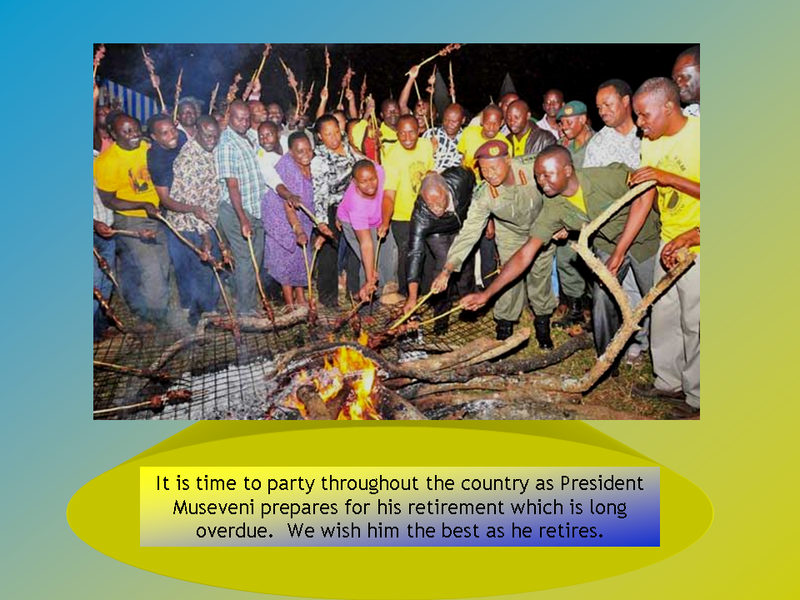 Meanwhile, President Museveni can start farewell parties throughout the country. We surely believe that he sees the signs showing RED for him come 2016. 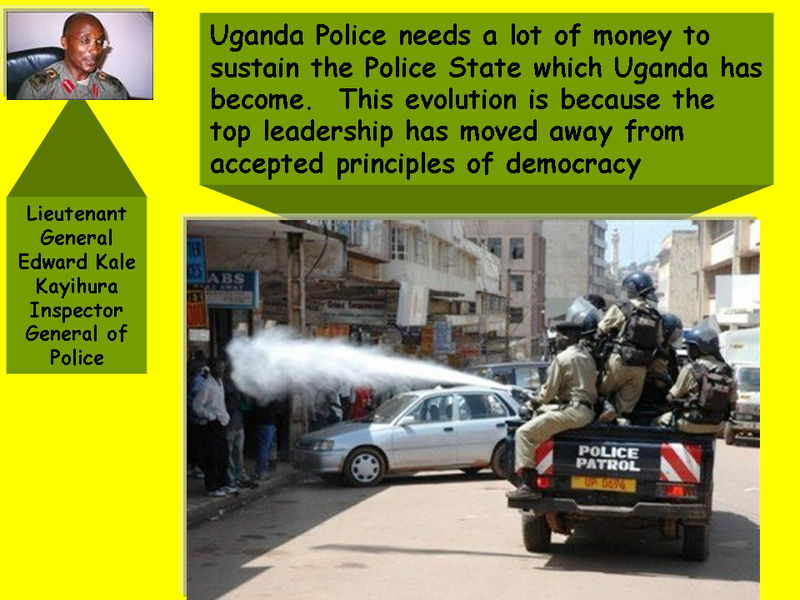 SHS 600BN NEEDED TO SUSTAIN THE POLICE STATE UGANDA HAS BECOME! 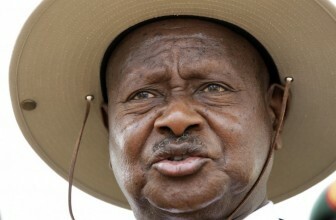 COULD THE ICC BE THE SOLUTION TO GET MUSEVENI OUT OF OFFICE? The way forward with Museveni may be to look through his over 26 years activities and see whether there are crimes for which he can be taken to the International Criminal Court (ICC). 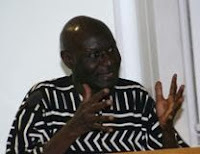 Dr Olara Otunnu in London UPC Party President Dr. Olara Otunnu, who is on a working visit to the United Kingdom, has established a contributory link between President Yoweri Museveni’s role and the war crimes for which Congolese warlord Thomas Lubanga was convicted by the Hague-based International Criminal Court [ICC]. In an exclusive interview with this news paper, Dr Otunnu started by welcoming the conviction of Thomas Lubanga. “I am happy with the conviction. Actually, it’s the first conviction of the ICC since it was established in 2002,” Dr Otunnu said in reference to the March 14 judgement. Commenting on the specific charge of recruiting child soldiers for which Lubanga was convicted, Otunnu, a former UN Under Secretary General for Children in Armed Conflict, also highlighted his role in framing the war crimes offence. “The three charges against him were all to do with the recruitment and abuse of children,” said Otunnu, adding that: “In fact, the particular provision in the Rome Statute under which Thomas Lubanga was convicted is something I drafted myself.” Otunnu said. The UPC leader also wasted no time in establishing a firm link between Lubanga’s crimes and Uganda’s role in aiding and abetting those war crimes. “Lubanga was a relatively small player in the DR Congo. What gave Luganga his power and sway in the Congo was actually sponsorship by Ugandan leaders,” Otunnu said. He added: “As you know, this is not Olara making things up. There is a very thick Judgement that was delivered…not by the ICC…but by the International Court of Justice. Numerous charges of crimes committed by Uganda in the Congo are in that Judgement. Aggression, crimes of war, crimes against humanity, it is all those things.” Dr Otunnu, a Harvard trained Lawyer, also said he believes that Ugandan leaders and commanders are legitimate suspects for prosecution under the Rome Statute. “The little fellow [Lubanga] who was manipulated from Uganda been charged, but the real fellows who were in charge of his crimes are walking scot-free. That is what is wrong with the application of the Rome Statue.” Otunnu charged. He said he told ICC Chief Prosecutor Luis Moreno Ocampo that the ICC’s process and choice of those to be indicted has been highly politicised and highly selective. “I still very much hope that what was done inside Uganda, on Ugandan territory and elsewhere in Congo will be punished. I hope to see a day of reckoning when the ICC will investigate and bring them to book for what they did.” said Otunnu. “Thomas Lubanga was not a hugely significant player in the overall scheme of things.” Otunnu maintained. END. Please login to www.ugandacorrespondent.com every Monday to read our top stories and anytime mid-week for our news updates. WHO IS BEHIND KASIBANTE'S TRYING TIMES? Moses Kasibante, former Rubaga North parliamentary contender was denied bail and was remanded again to Luzira prisons. 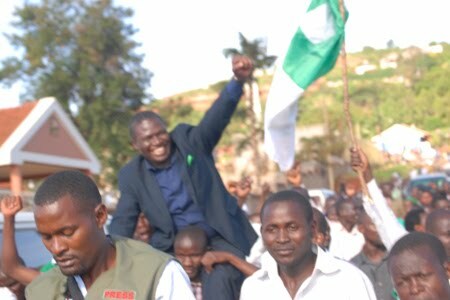 Kasibante was arrested from the High Court and later remanded to Luzira for jumping bail on cases of incitement to violence, rioting after proclamation, promoting sectarianism and malicious damage to property. Grade One magistrate, Susan Abinyo said she had received an application from the state prosecutor, Betty Agola asking court to deny Kasibante bail on grounds that he had jumped bail and ignored three criminal summon. Abinyo ruled against an objection by Kasibante’s lawyers and remanded him till April 25 when the bail application would be considered. 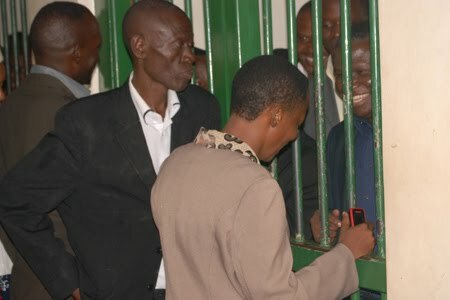 Kasibante was represented by his lawyers, Asuman Basalirwa and Erias Lukwago who had lined up a number of sureties and submitted an application for bail. Lukwago said after the ruling that they still had an option to apply for a production warrant. Kasibante’s brothers, John Ddumba and Ali Ssekayi wept at the court as prisons officers prepared to take him back to Luzira. The police were deployed heavily around the court premises and blocked the road near the court to block supporters who gathered in big numbers. Angola also rejected pleas to produce him the next day saying she had a backlog of cases and could not make quick adjustments. 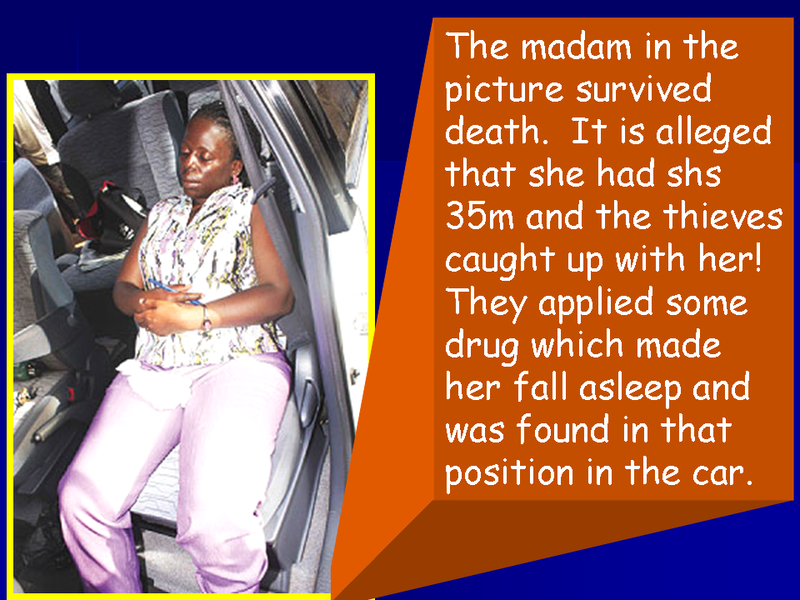 The lady in the photograph made a very big mistake when she traveled with shs 35 million. Money is a very scarce commodity, and at times some people have it and fail to figure out the risks in seeing to its movement from one place to another. Only if you have cash in your house, more often than not, someone will get to know that you are moving with cash. In Uganda one transaction which many times calls for cash is when purchasing land. This puts in danger the life of the one buying as well as that one selling. There is need to get to a compromise mode of payment which is safe for both parties. 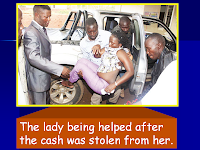 The lady in the photo could have been killed, but God spared her life. The prayer is that she recovers from that great loss and gets the courage to work again. Wednesday, 08 April 2009 08:50 By Patrick Matsiko wa Mucoori Increasing revenue but declining social services; What went wrong? Have you ever asked yourself why there is always shortage of or no medicine in that government health centre near your home, which leads to high incidence of deaths due to curable diseases like malaria? Have you ever asked yourself why your child is not getting quality education under Universal Primary and Secondary Education? Part of the problem is the astronomical amount of taxpayers’ money that goes to finance and sustain your President’s political assistants at the expense of social services and people’s general welfare. When President Yoweri Museveni came to power in 1986, the economy was in shambles and basic items like salt, sugar and soap, soft drinks were very scarce. The government was collecting as little as Shs 84 billion in revenue. Inflation was at 240%. His NRM government revived the economy and tamed inflation to single digits. Basic items became abundantly available in shops and markets. Today the government collects Shs 4 trillion in revenue a year, yet key sectors like education and health which used to be vibrant during the economic decline in the early and mid 1980s are declining fast today! With only Shs 84 billion revenue collections before the Museveni era, schools were reasonably stocked with scholastic materials like textbooks from government. Pupils and students were performing well in Primary Seven and Ordinary Level national exams. The number of candidates passing in Division One at P.7 and S.4 was higher in percentage terms compared to today. So how can services and materials which the government before 1986 used to provide with a purse of only Shs 84 billion be largely lacking today when the government is now collecting four trillion shillings? What has gone wrong? While Uganda’s national purse has been growing fast, wasteful expenditure on President Museveni’s redundant public administration has also been increasing by leaps and bounds. Uganda’s improved revenue collections since 1986 have been overstretched by the ever widening expenditure on Museveni’s political assistants who largely add no value to social/national development. Donors, civil society, private sector experts and political activists have repeatedly raised concerns over the government’s rising cost of public administration over the years, but their pleas have fallen on deaf ears. 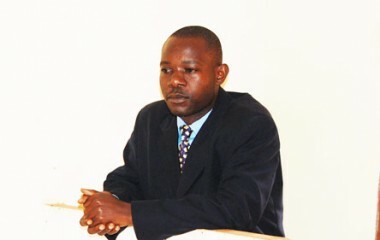 In a meeting in 2007, members of the private sector under the Private Sector Foundation of Uganda (PSFU) asked the government to cut expenditure on public administration as well as revise the national education curriculum to ensure the training of skilled manpower, in line with current market demands. In a paper titled Private Sector Platform, referring to the incessant demands by Uganda’s donors, the private sector called for budget discipline in the 2007/08 financial year. The private sector asked the government to channel most of the resources to sectors that create jobs, wealth and generate income instead of investing too much in public administration. Review of the 2005/2006 annual budget performance shows that 46% of the government’s supplementary expenditure went into funding public administration. Uganda with 30 million people has a very large Parliament and cabinet per capita (333 MPs, 70 ministers and about 80 Resident District Commissioners and their deputies), all getting huge salaries and allowances per month. During a consultative workshop on Commission for Africa (CFA) at Speke Resort Munyonyo in Kampala on January 27, 2005, the participants reflected on Uganda’s situation and noted that Uganda is over-governed as indicated by the high cost of public administration. A limit should be set on the amount of public funds that can be assigned to public administration, the CFA workshop report reads in part. This situation has been the same since the NRM came to power and is likely to escalate with the creation of new districts and more political appointees of the president. Despite Uganda being the first beneficiary of the Highly Indebted Poor Countries initiative in April 1998 and May 2000, Ugandans have not realised the fruits of the relief because of the ever-expanding cost of public administration. 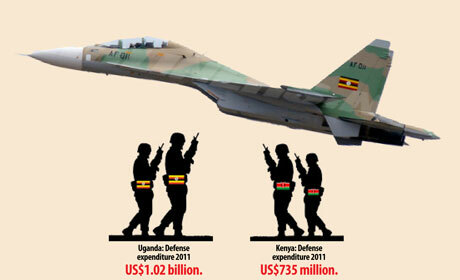 Uganda is still heavily dependant on foreign aid (40%) to balance its national budget. In the 2007 Universal Primary Education review, it was discovered that one of the reasons why the quality of education had declined seriously in UPE schools was shortage of teachers. In response, President Museveni said government did not have enough money to recruit more teachers and the situation could remain the same for years. There has also been a persistent cry of shortage of drugs in the government’s Health Centre IVs at sub-county level. The government explanation has been shortage of funds to buy the required medicines. Some analysts say the biggest problem is not necessarily the lack of funds, but the prioritization of government’s expenditure. They argue that if the government reduced its huge expenditure on public administration, there would be enough money to cure the shortage of teachers in primary schools and procure more drugs for local health centres. According to the Chairman of the Donor Economist Group, Mr Jeroen de Lange, Uganda needs 200,000 primary school teachers but it has 128,000 leaving a shortage of 72,000 teachers. According to estimates of the Ministry of Education, it costs Shs 8 million to build a classroom in Uganda. In our last edition, we looked at the cost of State House’s ever increasing expenditure on the Ugandan taxpayer. In this story, we take audit of the cost of the president’s political appointees at the expense of delivery of key social services like health and education. The political appointees include the 80 Resident District Commissioners and 80 deputies, 75 presidential advisors/ special assistants and 43 presidential private secretaries and their deputies. They total 278. Each presidential advisor and presidential assistant earns a salary of slightly more than Shs 2 million a month plus other allowances like fuel and imprest. This translates into Shs 178 million the government spends on monthly salaries and other allowances for the 75 advisors and assistants. This means that for every presidential advisor or presidential assistant’s salary, the country loses money for 10 primary school teachers’ salaries a month (at Shs 200,000 per teacher). The Shs 178 million is enough to pay salaries for 890 teachers every month and translates into Shs 2,136,000,000 a year, which is enough to pay 10,680 teachers. Each presidential advisor and assistant also gets gratuity of Shs 9.9m every year. This comes to Shs 742.5 million for the 75 advisors and assistants. 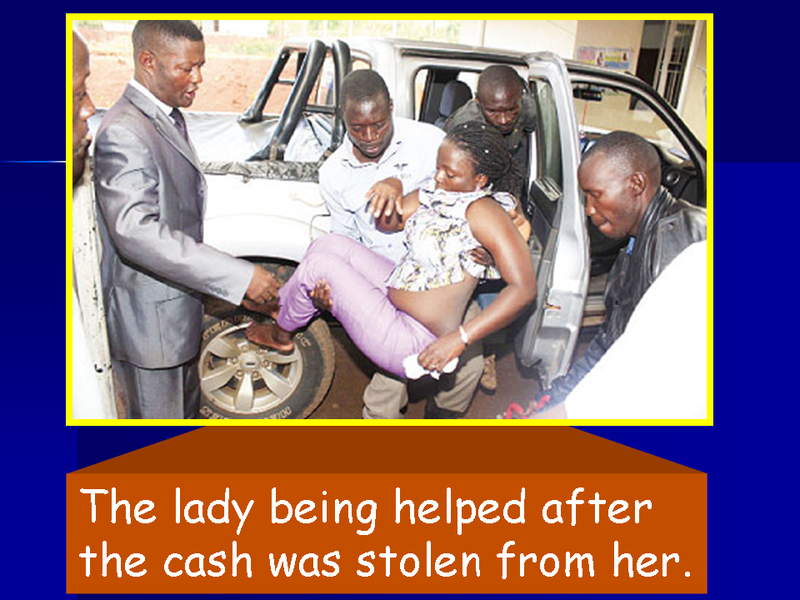 When the gratuity is added to their annual salaries and allowances, the amount is Shs 2.9 billion. This is enough to pay 14,400 primary school teachers or build 360 classrooms to accommodate 18,000 pupils if we take 50 pupils per classroom. This money can also buy enough drugs for 343 Health Centre IVs for a whole year. The government also pays Shs 2 million for salary to every Resident District Commissioner and one million shillings to each Deputy RDC. There are 80 RDCs and their deputies, which brings the total number to 160. Their total earnings in salaries and allowances per month amount to Shs 249 million. This is enough to pay for 1,245 teachers a month. If we take an example of a Health Centre IV which receives drugs worth Shs 8,400,000 a year, the Shs 249m can pay for drugs for 29 health centres and 69 UPE schools of 800 pupils each for a whole year. Apparently, government allocates Shs 507 to each UPE pupil a month for the three months of the school term. This means government gives Shs 405,600 to a UPE school of 800 pupils a month, which amounts to Shs 1,216,800 a term and Shs 3.6 million a year. This shows that a monthly salary of one RDC can pay for a UPE school of 800 pupils for a whole term and still leave a balance of about Shs 800,000. Government pays Shs 41,000 per student in Universal Secondary School per term. In a school of 800 students, the government pays Shs 32.8m a term. At this rate it means that salaries of 16 RDCs are enough to support an 800-student USE school for a whole term. The overall total of the government expenditure on advisors, presidential assistants, RDCs, deputy RDCs, presidential private secretaries and their deputies alone is about Shs 7.5 billion a year. This money would support 2,077 UPE schools of 800-pupil enrollment or buy drugs for 890 Health Centre IVs, construct 935 classrooms, or pay for 37,500 primary teachers, half of the additional 72,000 teachers required to lift the quality of UPE. This means that if Uganda was not spending on RDCs and presidential advisors/assistants, whom the country can conveniently do away with any way without suffering any negative effect, we would solve the shortage of primary teachers, shortage of drugs in most rural health centres and have more classrooms for the UPE pupils who are now studying under trees. Museveni justifies the appointment of presidential advisors, RDCs and presidential aides arguing that they help in effective service delivery to the people. But our neighbour Kenya does not have Uganda’s State House-style presidential advisors and special assistants yet it’s the most vibrant economy in the Great Lakes region. Kenya’s presidential advisors are civil servants recruited through the normal public service recruitment process like was the case in Uganda in the 1960s. They are neither handpicked nor are they party loyalists like is the case in Uganda. They are recruited on merit. 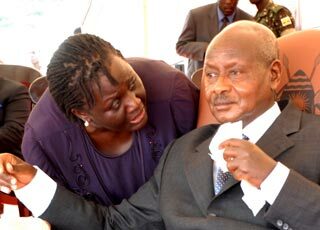 “What makes it worse for Uganda is that Museveni appoints advisors whom he actually advises or lectures to. Many have failed in politics or the competitive private sector job market. Appointing them, therefore, is a way of trying to find where to place them for survival,” said an observer, who declined to be named because of his position in government. Some of the presidential advisors The Independent talked to said they had not met the President for more than two years. This means that for more than two years they have been receiving salaries and other emoluments for no service rendered. So the next time you wonder why there is no medicine in your local hospital or no textbooks in your school, know that part of the reason is that the money for that purpose was used to pay Museveni’s RDC and advisors who never advise. EDUCATION COMMISSION OF INQUIRY TO CONTINUE ITS WORK First published: 20120310 5:53:32 PM EST The NRM parliamentary caucus has agreed to lift an injunction on the work of the judicial commission of inquiry into UPE and USE. Parliament passed a resolution halting the work of the commission after the education minister Jessica Alupo informed the house that she had not received any report from the team. NRM parliamentary caucus spokes person Anite Evelyn has told journalists at parliament that the caucus decided to support the commission after they were briefed on the progress of the investigations by the commission chairperson justice Ezekel muhanguzi. Anite says the interim report from the commission indicates that the team had unearthed a lot of glaring rot in the ministry, some of which has been reported by the auditor general. Anite says the report indicates some ghost teachers and pupils under the UPE and USE program, and such things had led government to loss over 2 billion shillings. She says the commission also indicated that their work was hampered by the ministry of education when it failed to release the funds in time for them to start work By Isaac Senabulya WHY IS MUSEVENI BUILDING THE REGION'S STRONGEST ARMY? NO SHAME: Jaberi Bidandi says the president has lost a sense of shame Says President has lost sense of shame The People’s Progressive Party leader, Jaberi Bidandi Ssali, says President Museveni has lost the conscience to lead after he claimed that his advisors and ministers misled him on the matter of Hassan Basajjabalaba’s Shs 142bn compensation. “I think the President has reached a point where he feels so secure; everything is under his control and he no longer has this feeling of shame. What matters to him is what he wants and the moment he gets it, the rest does not matter,” Bidandi Ssali told The Observer on Wednesday at his residence in Nsimbiziwoome, Ntinda. “As far as I am concerned, that is a loss of conscience on the part of the leader.” Bidandi said it could not be possible that a head of state could be hoodwinked that easily into signing off billions of taxpayers’ money. The former minister, who periodically writes to Museveni addressing various issues, said had he been in the President’s shoes, he would have accepted political responsibility and resigned. “He [Museveni] should show humility. This is concealed arrogance; a feeling of invincibility… it is dangerous to him, dangerous to his family and dangerous to his country,” said Bidandi, who was visibly concerned. He expressed doubt as to whether the Shs 142bn went to Basajjabalaba’s account or whether the businessman, who heads NRM’s Entrepreneurs League, even got a quarter of the sum. Bidandi fears the bulk of the money could have been used to fund ruling party activities, such as election campaigns. Bidandi, who was minister of Local Government when Basajjabalaba sought to redevelop the Constitution Square, said the businessman didn’t deserve any compensation for it. Bidandi blocked the defunct Kampala City Council from awarding the businessman a lease to redevelop the green park in the city centre. “I took trouble to explain to KCC [not to give away Constitution Square], but they were not heeding. I stood firm and took the matter to the cabinet. Some people in cabinet did not see the significance of what we were talking about; so, we agreed to set up a commission of inquiry, which was headed by Chris Mudoola. Fortunately, [the commission] came up with recommendations which fortified my position that this is one place in Uganda that should remain forever as a monument,” Bidandi said. Last week, two ministers — Syda Bbumba (Gender, Labour and Social Development) and Dr Khiddu Makubuya (General Duties) — resigned after months of sustained pressure from Parliament. The two ministers are accused of misleading Museveni on the compensation. Bidandi said the duo’s resignation should only be taken as a good sign for those “who have staked their necks in the 9th Parliament to take the bull by its horns”, not as an indicator that Uganda’s fight against corruption is coming of age. Otherwise, he said, if public officials are committed to preserving their integrity, Bbumba and Makubuya should not have put up any resistance before they resigned. Bidandi counseled that any position of leadership is easy to administer provided a leader follows the law and retains their integrity. He said when he served as minister of Energy (in the late 1980s) and of Local Government (mid 1990s), he was faced with many tempting situations, but he did not give in. “At one time, I was in charge of authorizing the purchase of oil worth $7m every month. Imagine the temptation of pocketing even 10% of that figure per month. But I could not have any of it,” Bidandi said. In Local Government, he added, an official from KCC once approached him with a list of buildings in the city whose leases had expired. The official asked Bidandi, who as minister was supposed to validate a fresh bidding process, to make his pick, but he declined. “People should try to rediscover the seat within their heart of integrity and the basis for serving the people,” Bidandi said. ekiggundu@observer.ug INSTABILITY OVER MUSEVENI’S UNDOING PREDICTED Written by: amrwaga on 7th January 2012 Source:http://str8talkchronicle.com/?p=19702 by Anthony Rwaga, Str8talk Chronicles, 2012-01-07 President is now 67 and cannot govern forever Handel was wrong. "King Museveni shall not reign forever" Election year 2016 will be a turning point for Uganda, according to a report by the powerful American policy solutions provider, the Centre for Strategic and International Studies (CSIS). As a sign of likely instability, the June 30 report notes that “the NRM is on a long-term trajectory of decline, and thus its survivability by the end of President Museveni’s current presidential term is certainly in doubt.” Titled “Assessing risks to stability in Sub-Saharan Africa”, the report was commissioned by the Unites States of America’s military Africa Command, AFRICOM, which plans for America’s strategic security interests on the continent. The US government often uses the CSIS reports to project the future and strategize for change. The report is based on events that have toppled regimes that appeared to have a firm grip on power in Egypt, Tunisia, and led to a western-backed armed rebellion in Libya. It is designed to delve below the day to- day events, like social and political unrest, to explain how historical and structural issues like unemployment, frustrated educated youth, political sterility, corruption, and abuse by security forces cause governments to collapse. It notes that although there are fundamental conditions that the people might not necessarily be contented with and the likely channels of a conflict, the decisions that will be made by the President on whether to run again or leave office in 2016 might be a great threat to Uganda’s stability. 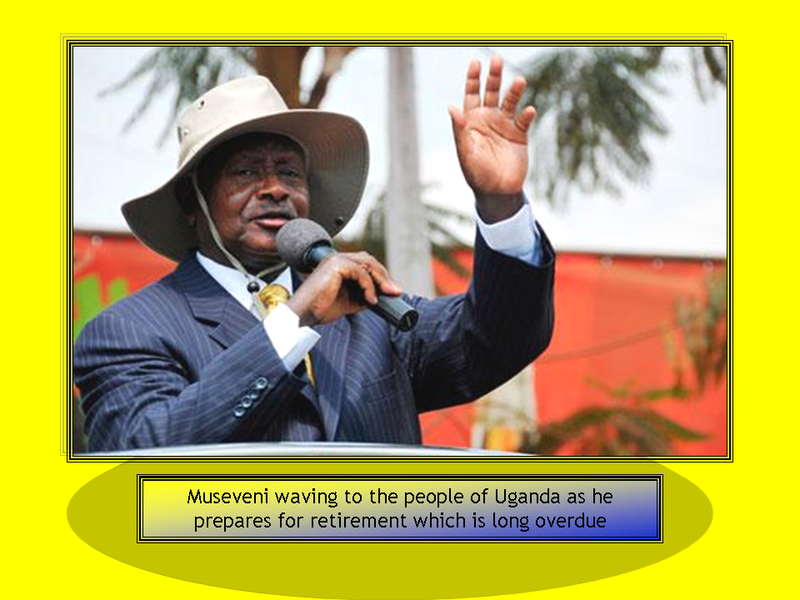 “Museveni is now 67 years old and he cannot govern forever,” the report says. “Things might look okay for a moment and his ground secure given his recent election victory, his firm control of the state apparatus and the political opposition that is a bit disorganized and underfinanced, but a difficult political transition is looming.” “Two broad elements determine a country’s vulnerability to destabilizing crisis,” the report says, “first is the depth, intensity, and cumulative effect of structural weaknesses and fault-lines. But equally important is the country’s ability to manage and mitigate those structural factors in a way that makes any shocks to the system less potentially dangerous.” Uganda does not have a history of changing power peacefully. In 1966, the country’s first president, Sir Fredrick Mutesa II was ousted and exiled after a violent attack on the Buganda monarch. Milton Obote who ousted Mutesa was himself toppled in a coup in 1971, to return in 1980 and be overthrown in another military coup in July 1985. To become president, Museveni fought a bitter five-year guerrilla war that claimed thousands of lives. There is growing fear that unless the transition from Museveni to another leader is handled properly, it could lead to another bloodshed. The uncertainty of NRM or Uganda after Museveni is a big threat to the stability of the country. Sham elections The report is based on studies in 10 countries; Angola, Botswana, Ethiopia, Ghana, Kenya, Rwanda, Senegal, Sudan, and Uganda, that it describes as “undergoing the growing pains of democracy”. It notes: “In Ethiopia, Uganda, Rwanda, Sudan, and Angola – democracy has little meaning beyond the ritualistic holding of elections in which political space is severely constrained and the winner is generally predetermined”. Joel Barkan, a professor of political science at the University of Iowa and a specialist on politics and development policy in sub-Saharan Africa whose books about the politics of Sub-Saharan African countries are recommended readings in many universities, wrote the Uganda section of the report. He notes that change is inevitable by all means either through anointment of a successor by Museveni himself or through the overthrow of Museveni or his chosen successor. He says the style of Museveni’s governance has grave implications for the future stability of the country because it is highly personalised that the running of the country to a greater extent revolves around Museveni’s personal position. At the centre of the report lies a big question on whether Museveni will run for a fifth elected term in 2016 at the age of 73 or who will be his successor if he decides to step down and how the succession will be managed not to create disputes both within the party and the country at large. 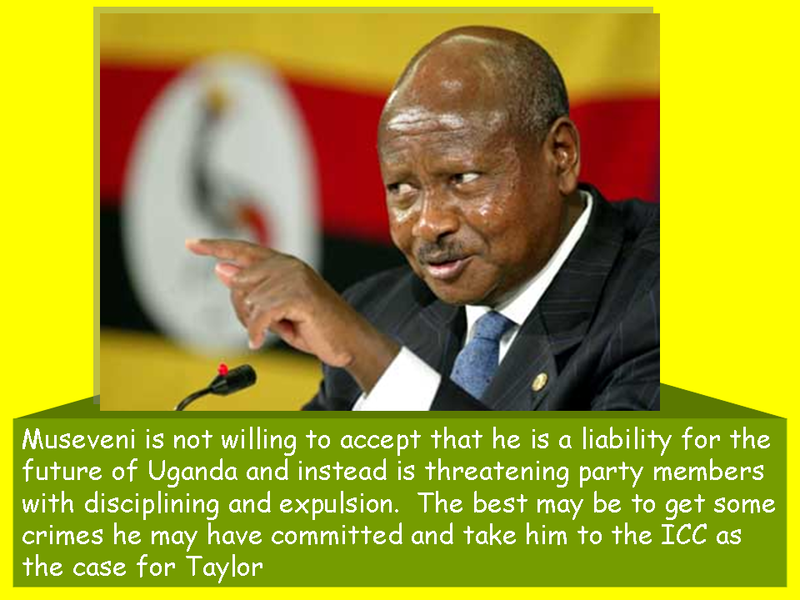 Although he seems to have an insatiable desire to remain in power, Barkan counsels, Museveni should be realistic enough to know he does not have much time left and the sooner he drafts his end game the better for him and his country. Succession battles Former Vice President Gilbert Bukenya, who had been in office since 2003, had been looked at by some as Museveni’s possible successor until the May cabinet reshuffle and his indictment before the courts of law over alleged corruption. 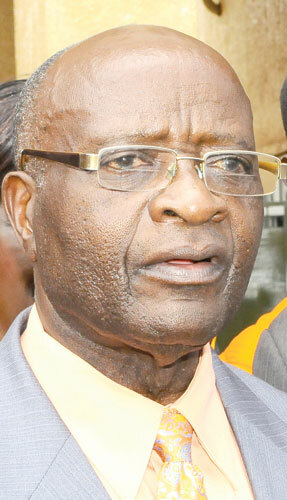 Bukenya’s fall into disgrace is seen largely as a continuation of infighting within the NRM party between him and its powerful party Secretary General, Prime Minister Amama Mbabazi, who long ago announced that he was in “the queue” to be president. With Bukenya out and the new VC, Edward Ssekandi, happily existing beneath Museveni’s wings, the report says it is likely the man who has ruled Uganda for quarter a century is lining up his eldest son, Lt. Col. Muhoozi Kainerugaba, to take over power. But, it notes, this is unlikely to go unchallenged by the party itself because the elevation of Muhoozi would largely keep power in current hands. Observers say Muhoozi is a soldier and not a politician and would face considerable opposition even from NRM. Apart from the president’s son and Mbabazi, the other contender would be Foreign Affairs minister Sam Kutesa. However, both men have unusually little support in and outside the party. They are also in their 60s something that might not go well with many younger politicians in the party who would like to see party leadership passed to a younger generation. The fight to succeed Museveni was publicly exposed in March when a leaked Wikileaks cable showed Mbabazi’s daughter, Nina Mbabazi, to have said in 2009 that Museveni was “too tired” to seek re-election in 2011 and that her father was the likely successor. Nina reportedly told a US embassy official that Kutesa was not a “serious contender” but was working to “sabotage Mbabazi”. Another contender not mentioned in the report is Museveni’s younger brother, Gen. Caleb Akandwanaho aka Salim Saleh. During a Kfm radio interview in June, Saleh said he personally felt Museveni should hand over power to another person in 2016. He said he could take over the mantle of president if “necessary”. It is not unusual for Museveni’s inner team to throw such sentiments around in order to gauge the public reaction. Sources close to State House have also told The Independent that Museveni is consulting widely about leaving power in 2016. Renowned historian, Prof. Ndebesa Mwambutsya of Makerere University said the issue of Museveni’s succession should be every one’s concern and not only NRM party members. He said the names the report puts forward as possible successors have high chances of being challenged considering Uganda’s regional and religious differences. “Muhoozi, Mbabazi and Kuteesa all come from the western part of the country and other regions especially the Baganda will not take that,” he says He says the Baganda have waited far too long for an opportunity of one of their own leading the country and the Catholic community will not like that as well. “I agree with Barkan that there is an alarming problem and I think the president has created a vacuum that he needs to fill before things get out of hand,” Ndebesa said. Initial indications were that Museveni’s drive to run in 2016 was mainly because the NRM fears that if leading opposition figure Col. Kizza Besigye decides to run for a fourth time in 2016, no other candidate can defeat him. Recently, Besigye has announced that he will quit as president of Uganda’s leading opposition party, the Forum for Democratic Change (FDC) before 2016. He has, however, not ruled out running for president of the country in 2016. America’s dilemma Besigye is a close ally of British Prime Minister David Cameron’s Conservative Party. However, he is yet to secure an endorsement from US President Barack Obama, which is usually crucial in African politics. The report notes that by sending troops to Somalia, Museveni has positioned himself as an essential ally of the west, especially the US, in the fight against terror. But the US continuing to support his stay in power puts it “in an increasingly awkward position in Uganda”. “The United States thus faces a classic dilemma in Uganda – continuing its current policy of accommodating and working with an authoritarian ally, or encouraging democratic reform to secure long-term stability,” the report says and adds: “Secretary of State Hillary Clinton’s address to the African Union on June 13, 2011, suggests that the United States will henceforth emphasize democratic reform, though she did not mention Uganda by name”. This is not the first time that the US is pledging to support a democratic transition of power in Uganda. At the start of the 2011 presidential election campaign, the US Congress ordered Clinton to closely monitor and report on the conduct before and after the election. Although most observers of the Feb. 18 general elections said they were far from “free and fair”, the US has not taken any action publicly. However, that does not mean the US and other pro-democracy western government will not act on this latest report. The US embassy in Kampala was involved in forcing the Uganda government to allow Kizza Besigye to fly to Nairobi for emergency treatment after he was brutalized by the security forces to near blindness in April. Soon after, Besigye flew to the United States where made a point of showing his bandaged arm in a style similar to that of Zimbabwean opposition leader Morgan Tsvangirai after he was brutalized by dictator Robert Mugabe’s security forces. Too early to speculate? Prof. Mwambutsya says there might be chaos in Uganda’s politics when Museveni leaves power because there is no signal whatsoever that Museveni wants a successor yet. “If you look at South Africa, Mandela prepared Thabo Mbeki as his successor but Museveni has not done anything that suggests any one as his successor and he is wise enough not to leave abruptly,” he said. The opposition party FDC Publicity Secretary, Wafula Oguttu, says “for sure there will be some sort of a clash whether Museveni decides to stay or imposes any person on his party or the country”. “He might end up like Gaddafi or Mubarak because Ugandans will not sit back and watch one man drive the country to destruction,” he said. Hosni Mubarak was kicked out as president of Egypt by violent protesters while Gaddafi is battling a popular western-backed armed rebellion against his regime. Wafula said Museveni is likely to stand again in 2016 “because it’s in his nature that he does not care about what Ugandans think or feel”. Some, like prominent political researcher and analyst, Dr Golooba Mutebi of the Makerere Universities Centre for Basic Researc it is too early to speculate on Museveni’s succession or whether he will run in 2016 or not. “I don’t think the issue of succession is a debate within the party now, I think it will come up maybe two years or two and a half to the election,” he says. Makerere University Political Science Associate Professor, Yasin Olum says “there might not be any need for succession” because Museveni will come back in 2016. “Even if he decides to step aside, his succession will be determined by internal party democracy,” Olum says. But others disagree. 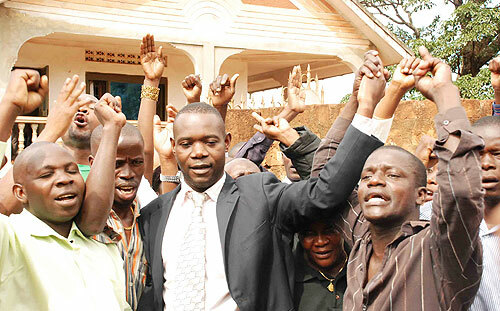 “Any election in NRM will be façade,” says Mwambutsya. He said the appointing will largely, if not wholly, depend on Museveni and the ‘big men’ in the party. “They might put a ‘window dressing election which will have little or no influence at all concerning the matter,” he added. “We all witnessed how fair the NRM elections could be during last year’s party primaries. It would be naïve therefore for party members to think they will have their chosen successor through a non- manipulated, free and fair election,” another commentator said. Ndebesa said Museveni himself might be in a crisis and we might have a Zambia situation where Kenneth Kaunda left with his party. “If I were him, I would prepare a peaceful succession so that the situation does not turn out bloody,” he said. Other causes of instability Golooba says unrest might not necessarily emanate from Museveni’s succession. 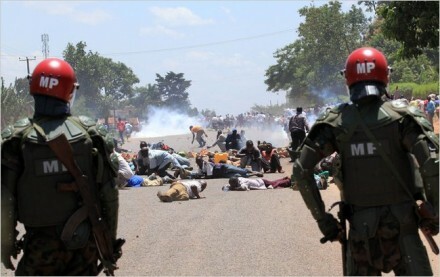 “There are many other factors that are likely to create instability in the country. People are not happy with the current economic situation and that has been manifested through the various strikes we have witnessed. That in itself is an unrest that might exacerbate, ‘’ he said. While the report agrees with Golooba by highlighting other possible catalysts of a threatening crisis like the falling government revenue, rising inflation, rising corruption and a transition to an oil economy, it holds the president largely responsible for this situation by increasingly relying on patronage to remain in power. The report highlights two forms of patronage namely the tolerance of corruption especially by cabinet ministers who use their offices for personal gain and the handing out of both offices and cash to willing takers. The latter is held fundamentally responsible for the awful present economic situation where the president allegedly pumped a lot of money in the public to get votes. The report traces the habit to way back in 2005 when members of parliament were given Shs5 million each to chang the constitution and repeal presidential term limits so that Museveni could run in 2006. Before this year’s general elections, the MPs were this time given much larger packets of Shs20 million each. The report says the president himself was photographed handing out “envelopes” on numerous occasions at political rallies and says a rough figure of $300 million given out in campaigns would not be unrealistic given the magnitude of the practice. This has been held largely accountable for the current inflation and the central bank’s failure to avert the situation because foreign reserves were exhausted to finance campaigns. “Expenditures by the office of the president have clearly risen as Museveni has sought to meet the rising demands of patronage as well as the cost of running for re-election in the multiparty era,” the report says. The report also says that the discovered oil which most people look at as solution to Uganda’s problems might be a source of crisis itself. The government has already refused to release information about the existing and future agreements between potential producers citing “national security” for its lack of transparency. Barkan projects that the advent of oil revenue is likely to raise the public’s expectations for services and exert pressure on Museveni’s government. There is also a possibility that oil will ignite debates about federalism and the rights of oil producing communities to a greater share of the national revenues. Other possible causes of instability in an already shaken state, the report says, are security factors. The report still considers the LRA rebels and the consequences of their operations as a threat given the decline of governance in most sectors. It says if the government does not do something about the disparity of living conditions between northern and southern Uganda, there is likely to be conflict. It also says there might be hostilities between North and South Sudan and a possibility of a civil war in the world’s newest country arising from a scenario of factional fighting between the leaders of the principal ethnic groups across the south could create a conflict that might spill over into the impoverished northern Uganda. There is also a threat from the Al-shabaab in Somalia where Uganda has contributed 6,000 of the 8,000 of the African Union peace keepers there. 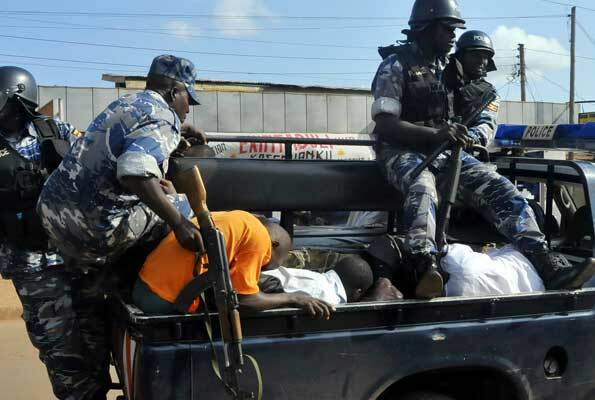 The militant group has already shown its fury by last year’s July 11 bombings in which about 80 people were killed in Kampala, something that many Ugandans blamed on Museveni. According to the report, all these other conditions could be there and Ugandans tolerate them like they have always done with all the other issues that have unfolded in the current regime but the issue of Museveni’s succession might not leave the NRM together and might strengthen the weak and scattered opposition. Prof. Ndebesa said however that the projected crisis will do the country a lot of good“The crisis, if it happens, will cause troublebut it will be good for democracy,” he said. COULD MALAWI BE MILES FROM UGANDA?